In honor of the publication of her edition of Sylvia Beach’s letters, I wanted to do something special here at Fernham. As part of Sylvia Beach Week, Keri Walsh and I “interviewed” each other over email. We continued the conversation we began at her reading at Bluestockings books in May, touching on the challenges of editing, on women modernists, on bookstores, archives, and common readers. We could barely stop talking, so the conversation is in four parts. I hope that you enjoy reading it as much as we did writing it! Anne: Anyone who loves Sylvia Beach must also love bookstores. Can you tell me about one or two of your favorites and what they offer? Keri: Some bookstores have such intellectual energy that they make you feel smarter. 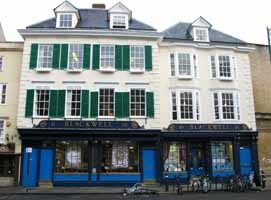 Blackwell’s in Oxford is one of them. You can take your notebook in there and emerge three hours later having done all the research for your latest piece of writing. Blackwell’s has every book you could ever want, at least in the Humanities, and you never know who’ll be sitting beside you in the second-floor café. There’s a certain jetset element, a Hello magazine blend of Rhodes Scholars and children of foreign potentates. It makes for glamorous people-watching: you can try to pick out the next Bill Clinton. The main Blackwell’s shop, which opened in 1879, is located in an old house right across the street from the Bodleian, and from the café you can see across the street to the dreaming spires and the Sheldonian theatre. I think I grew to love Blackwell’s because it gave me what the Bodleian couldn’t. Some days I didn’t have the patience for Old Boddy: the books are locked away, can only be called up in small quantities, and you can’t wander in the stacks or take things home, and you certainly can’t drink Diet Coke in there. All of this leads me back across the street to Blackwell’s. There’s a huge floor in the basement called the Norrington Room (a friend of mine used to call this area the TARDIS, after Dr. Who’s police box). The store had to excavate beneath Trinity College’s gardens to accommodate it. The TARDIS holds the philosophy, religion, feminism, film, and cultural studies books. That’s where I would disappear to read things that weren’t quite approved of by my tutors— French feminism, American cultural studies, and anything else that seemed too jargony or flighty. And then, if you hike up about five flights of stairs, you get to the second-hand section. That’s a great place to find out-of-print women’s novels published by Virago in those gorgeous green-backed books—books like Rosamund Lehman’s Dusty Answer, my favorite best-seller of 1927. Keri: Please tell me about your favorite bookstores, and what they offer. Anne: I grew up going to Seattle’s University Bookstore with my family on the weekends. The children’s section and the magazines were on a balcony overlooking the main floor. My father would browse history while my mom, sister, and I picked out books for ourselves. I remember presenting him with a stack of two or three and having him assess my choices, and substitute one book for two others he deemed better. Those were golden hours. Now, I dream daily of Greenwich Village’s Three Lives Books. I feel smarter just going in. That’s a reader’s store: a store to discover great fiction. The staff is wonderful and friendly and though I don’t go nearly as often as I like, they are kind and so knowledgeable and genuinely interested in reading. It’s a lovely little space: just big enough to linger in, but small enough not to be overwhelming. The perfect stop on the way to the PATH train & back home to Jersey. And, of course, in London, I have to go to Hatchard’s, the shop Clarissa browses and still a great browsing store in an old townhouse off Piccadilly (though it’s a chain now). I wish New York had a good academic bookstore: I miss having a place to browse through the books that I see advertised in The New York Review of Books (on those rare occasions when I get to it). Bluestockings comes close, but I want a broader political range, not only radical books. My husband tells me that NYU has just redone its bookstore and made it into a flagship. I have high hopes for that. I haven’t spent a lot of time in Oxford, but I know just what you mean about the Blackwell’s there: it’s certainly a pilgrimage spot for me. Seminary Books in Chicago is the only American bookstore I know that comes close to giving you that incredible feeling of stretching your brain, making you long to read serious, important books, new and old. New York’s Drama Bookshop is a space like the one you describe in London. Do you know it? Kris Lundberg of the very Woolfian Shakespeare’s Sister Theater Company did a staged reading there on Woolf’s birthday one year and invited me to speak. They have a small black box performance space in the basement. If you haven’t been, treat yourself! Keri: When describing Sylvia Beach’s taste in books and her reading practices, I often end up borrowing Virginia Woolf’s idea of the “common reader.” Making books available to a wide range of people in every walk of life was important to both Woolf and Beach. And they both liked to make fun of academics who took themselves too seriously (I love Woolf’s academic satires in To the Lighthouse). Can you say something about Woolf’s fondness for “common reading,” why the concept is so important to her, and also perhaps what role it plays in your own editorial practices, teaching, or reading? Anne: The notion of the common reader is really important to me. Woolf writes about reading what one likes and never pretending otherwise. She wasn’t always so confident, but by the time she was in her forties—my age now—she was. Her confidence, her refusal to let others turn her away from Euripides or a Countess’ memoirs, gives me confidence when I feel others challenging my choices. One of the things I love about blogging is the happy randomness of it, the way it allows you to graze around the web until, suddenly, you hit an unexpected pocket of intensity—some blogging community where everyone is writing fan fiction about Harry Potter or interacting with their favorite romance novelist or enjoining a group of friends to work their way through Don Quixote as I did with Bud Parr a few years back. My friend Lizzie Skurnick (who blogs over at the Old Hag and wrote Shelf Discovery) is my 21st century model for common reading: she can rattle off the plots of great forgotten bestsellers from the 70s and then, in the same paragraph, she’ll tell you about what she’s getting from this rereading of Thackeray. Although I never read as much as I want to read, reading is the great pleasure in my life and I love peopling my life and my imagination with—well, just everything I can gobble. When I teach, though, I want to communicate enthusiasm, but I don’t teach a lot of pop. The fun of pop and light fare is discovering it for oneself. I am happy to refer to Lady Gaga in the classroom, but I don’t teach her or Nora Roberts or Eat, Pray Love. My sense is that you want a teacher for those texts that are so intimidating or difficult that you wouldn’t tackle them on your own. In honor of the publication of Keri Walsh’s edition of Sylvia Beach’s letters, I wanted to do something special here at Fernham: all week, we’re celebrating Sylvia Beach. Please drop by for a new post—or two--on Beach every day. And then head to your local independent bookstore and buy a copy of The Letters of Sylvia Beach. Beach was the founding owner of Shakespeare and Company, the English-language bookstore in Paris. The bookstore doubled as a lending library, post office, youth hostel, and salon for Americans in Paris and all others who had an interest in modernism. Shortly after opening the store, Beach befriended James Joyce and, when he could not find a publisher, she published Ulysses. Beach is the most important modernist who was not a writer. It’s a Paris summer here at Fernham. I sit in this hot little rented house, staring out at the hazy St. Lawrence River, thinking and reading about Paris. This book was all the funnier coming on the heels of The Ambassadors, where Jamesian versions of these thoughts abound on the lips of the visitors from Woollett. It’s strange, then, that James asserts in the preface that “Another surrounding scene would have done as well.” And this is the very question that Erika Dreifus takes up in her essay on The Ambassadors, which she was kind enough to send me. There (in The Henry James Review, 25 (2004): 44-51), she writes about setting and the centrality of Paris to the novel from the perspective of a historian, teacher, and fiction writer. Another scene would not, could not, do as well—for Marie’s getaway, for Strether’s awakening, for James Baldwin or Richard Wright or F. Scott Fitzgerald or James Joyce or Gertrude Stein. Which brings me to remind you that I’ll be giving over Fernham for a full week to Sylvia Beach, the proprietor of Shakespeare & Co. and the first publisher of Ulysses. This is in honor of Keri Walsh’s brand new edition of Beach’s letters. 7. Henry James writing style is perfect for learning to diagram sentences (which I doubt anyone does any more). His sentences are very, very long. Likewise, his passages are very long. James can take two pages to say that two people look alike. 8. I have found at least one occasion in which James uses a word that doesn't exist in the English language, but looks like it should. In context, one can almost figure out what James was saying but who knows for sure. I am 58 years old. The protagonist in The Ambassadors is 55 years old. He and I are asking the same questions. How can you “reverse” the meaning of a James novel? As E. M. Forster wrote, “it is Paris that gleams at the center…--Paris—nothing so crude as good or evil” (via Erika’s article). What is the opposite of Paris? Don’t answer that. I think I’ve lived there, too. Watch this space for MORE PARIS! I was in San Francisco over the weekend at the CCCC (the National Council of Teachers of English’s big Conference on College Composition and Communication). It’s a HUGE conference, held this year at the downtown Hilton, much bigger than the MLA. But of all the many books I read, bought, and acquired over the weekend, the one that’s haunting me is a children’s book that I didn’t buy: Sara O’Leary (text) and Julie Morstad (illustrations)’s enchanting When You Were Small. I ran across it at an amazing little store of letter press cards, books, and ephemera, Little Otsu, across Valencia from both 826 Valencia and Range where we had a GREAT dinner. Little Henry asks about what it was like when he was small and his dad tells him a series of wonderful, fanciful lies: you had a pet ant, we used you as a chess piece, you used to take baths in the teapot... Don’t you remember? The haunting and detailed illustrations and the dry humor make it a tender little Edward Gorey fable. There’s a second book, too, and Morstad has some ABCs as well. I’m urging the Easter Bunny to fill the girls’ baskets with these books this year! You can see their titles at the lovely Simply Read Books website. Julie Morstad's drawings are at Canada's Atelier Gallery. And Sara O'Leary has a blog. Last week, I got an email from Kris Lundberg, the founder of a new nonprofit women's theater, Shakespeare's Sister. She wanted to know if a talk by her would be the kind of thing that would interest people at the Woolf conference (of course) and, by the way, did I know anyone who could give a 20-minute talk to open her celebration of Woolf's life? (but of course!) So, here it is, a staged reading of "Virginia" with a short talk by me to start it off! Please come & please do open your wallets w/the small $10 donation to help this exciting new company! Edna O'Brien's spectacular play encompasses Virginia Woolf's mercurial inner life, as well as the relationships of her three great loves: her husband, Leonard; her lover, Vita and her greatest writings. Ms. O'Brien touches the heart and captures the essence of Virginia's character and brilliant mind. Running time is ninety minutes plus a post-performance Q&A with author, Anne Fernald; director, Joannie Mackenzie and SSC Artistic Director, Kris Lundberg. Directed by Joannie Mackenzie. Starring Kris Lundberg* as Virginia, David McCamish* as Leonard and Shelley Ray* as Vita *All performers appear courtesy of the Actors' Equity Association. The Arthur Seelen Theater is located on the Ground Floor of the Drama Book Shop at 250 west 40th Street between 7th and 8th Avenue. in support of the Shakespeare's Sister Company. I know you know this already, but I am so excited for Lizzie Skurnick, who has a book contract for her charming series of columns for Jezebel in which she revisits favorite young adult novels. It’s a lovely and fun topic—and a useful one, too—for Lizzie helps keep alive the books that strong women loved as girls and, in doing so, gives new generations of parents a good list to take along to the bookstore and the library. Lizzie’s columns brought me to Jezebel in the first place and now I read it daily: it always brings me some kind of smile—laugh, giggle, or smirk. It’s a real cut above its parent blog, the once funny but now just mean and parasitic Gawker. I’ve written already about Meri Weiss’s debut novel, but I’m happy to report that it’s been selected as an August pick by the consortium of Independent bookstores (this used to be BookSense and is now Next List or something). And I haven’t yet finished Janice Erlbaum’s Have You Found Her, but this trailer sure reminds me why I was so excited about it in the first place. Finally, Jennifer Vanasco, whom I know only virtually as the founder of a listserv for writers and editors who went to my college, had her first cover story in the Village Voice, on the triumph of the lipstick lesbians. Congratulations to all four great women! I didn’t mean to take the whole week off, but things have been hectic--more than that--around here. The one bright spot, however, was getting out to see Anne Enright read last Wednesday at Barnes and Noble. This was my first Upstairs at the Square event and I was impressed. Over a hundred people were there, in the big, cavernous fourth level space. Enright and Camphor (the band she was paired with) shared the stage with host Katherine Lanpher. The tremendous beaux-arts glass windows behind them showed Union Square below, all aglitter from some ongoing police action. The conceit of these free monthly evenings is to bring a writer and a band together for an evening of conversation, reading, and music. I was a few minutes late and arrived to hear Enright reading the glorious opening of The Gathering, in which Veronica Hegarty thinks about her dead brother and about bones in general: his bones and the kind of bones that small children (she has two young daughters) come upon, that we tell them to put down as unclean). As she concluded her reading, the band slowly came in, playing a few melancholy chords at first and then gradually building into a lush song about bones, how all we know and love is just bones. It is so striking to come upon something like that, stressed and late, out of sync with the event. Was it pretentious? Was it cool? Was the song beautiful or just a touch too arty? I wasn’t sure, but it was good enough that I scanned the crowd for a more comfortable perch, found my friend, and sat. Katherine conducted a great NPR-style interview with Enright: warm, learned, welcoming, appreciative. And as I figured out the style of the show, my admiration for the whole enterprise grew. Enright talked about the choice to write flashbacks set in 20s Dublin, knowing full well that Ireland in the 20s means James Joyce. Then both women blurted out really heartfelt and loving praise for “The Dead.” That moment made me love them both (Enright, Lanpher) all the more: it wasn’t literary one-upmanship (in fact, sensing they were getting too literary, Enright gracefully backed off a moment later). It was just a moment of acknowledging that yes, Joyce is a monument and some might say invoking him is gutsy or audacious, but, wow!, don’t you love that story? The conversation turned to Camphor and their singer-songwriter Max Avery Lichtenstein. They played a second song, catchy, fun, and great; Enright read some more; they talked some more; the evening concluded with a second reading sliding into a connected song. And that was that. It’s a very smooth event: impressive, well done, not amateurish at all. And such a pleasure to watch a great interviewer at work: it’s a skill I’d love to have. You can see the event for yourself on the web. (If the long link doesn’t work, you can go to bn.com and click “media” and you’ll get there). All in all, as I said, a bright spot in a long winter. THE ABSTINENCE TEACHER. By Tom Perrotta. Thought about buying, but should probably read Drown first (since it’s on my shelf). EXIT GHOST. By Philip Roth. FALLING MAN. By Don DeLillo. THE INDIAN CLERK. By David Leavitt. THROW LIKE A GIRL: Stories. By Jean Thompson. AGENT ZIGZAG: A True Story of Nazi Espionage, Love, and Betrayal. By Ben Macintyre. CIRCLING MY MOTHER. By Mary Gordon. THE DIANA CHRONICLES. By Tina Brown. HOW DOCTORS THINK. By Jerome Groopman. HOW TO TALK ABOUT BOOKS YOU HAVEN’T READ. By Pierre Bayard. LEONARD WOOLF: A Biography. By Victoria Glendinning. TWO LIVES: Gertrude and Alice. By Janet Malcolm. THE GATHERING. By Anne Enright. THEN WE CAME TO THE END. By Joshua Ferris. That, in brief, is my brief version of the list.